Having trouble deciding what metal to choose for your beautiful new wedding, engagement, right hand ring, or custom one-of-a-kind uniquely-yours ring? They all start off as gold (with two exceptions) and alloys are mixed in to change the color and wearability characteristics. One of my favorites is rose gold, which has come on strong in recent years. Rounding out the list is platinum, a non-gold option and a timeless classic, truly hypoallergenic, durable and a pure white color. Palladium is also available but not as popular. The most popular wedding ring made today is a white gold ring coated with rhodium plating. The problem with rhodium plating is that it wears off after a year or two, and needs to be redone, so it becomes a maintenance issue. Luckily there are some newer white alloys on the market today. Jewelers like them because they really don’t need rhodium plating, and they are a little easier to work with than some of the other ‘white’ alloys. As always, the newer white alloys are durable and wear for long time. Yellow gold is slowly becoming popular again, and two-tone, white and yellow or rose gold is being used for wedding/engagement rings, as well as right-hand rings. The choices are vast, so be sure to discuss your metal choices with a professional jewelry designer who understands you and your needs, skintone and likes. 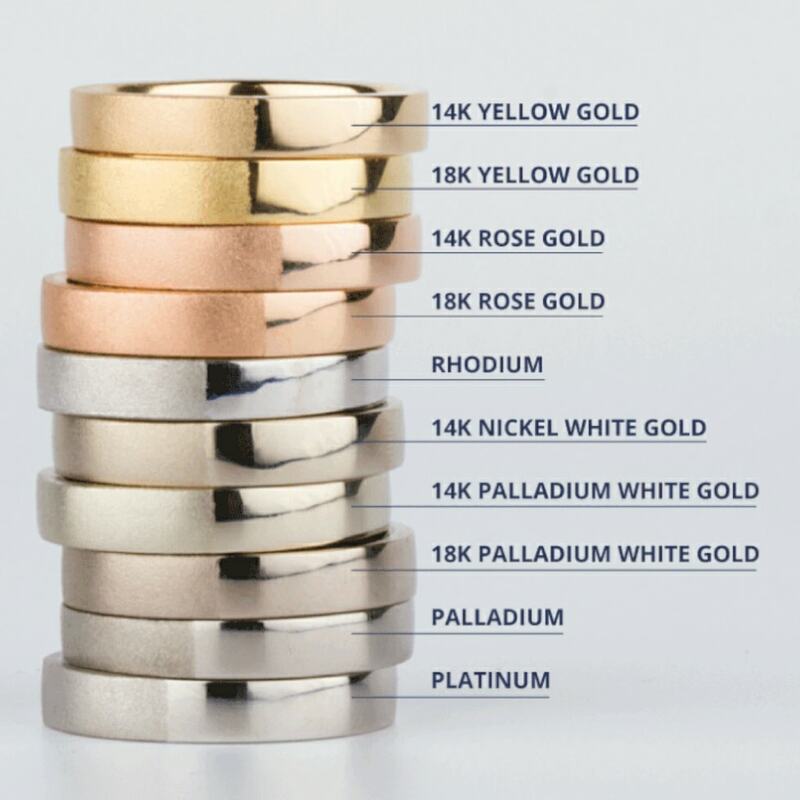 Different colors of gold wear differently, be sure to address concerns and lifestyle with your designer. The choice of metal alone can mean the difference between a unique custom-made engagement ring and a ho hum ring. So when you’re shopping Bend jewelry stores for your wedding or engagement ring, be sure to check out a fine jewelry designer who will listen to you and be open to new and unique metal combinations. Please feel free to contact me with any questions. I’ll get back to you right away.